Summer is almost over! This post/Giveaway marks the end of my 6 Months of Spring/Summer Skincare Giveaways with Reviva Labs!Thanks so much to all of you who have been loyally following this Giveaway/Review series! Reviva Labs is a clinical skincare company that is also environmentally conscious. The products are researched and they deliver great results. Reviva Labs items are available at natural foods stores, grocery stores, and even Ulta! If you missed some of my previous Reviva Labs review posts, be sure to check out these links! Expectant Mama Skincare Review, Expectant Mama Skincare Review (part 2), Reviva Labs Gentle Smoothing Cleansing Gel, Reviva Labs Vit E Stick, Reviva Labs Makeup Primer, Collagen Fibre Eye Pads and Willard Water Anti-Irritant Gel. 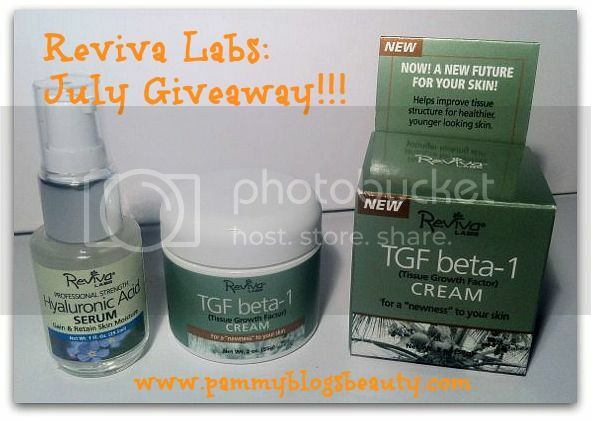 This Giveaway is for Reviva Lab's Hyaluronic Acid Serum and TGF Beta-1 Cream (or Collagen Regneration Cream). To hear more about these products and enter the Giveaway, please keep reading! I am such a HUGE fan of Hyaluronic Acid! It is a phenomenal ingredient for hydrating and plumping up your skin. I love that this Serum is super hydrating, yet it never breaks me out! This is a product that I like to always have on hand. I have used it off and on over the past year and have really had some nice results! Reviva Lab's Hyaluronic Acid Serum can be used as a moisture booster in addition to your usual moisturizers. Also, it can be used on its own. Just apply in in the evenings either alone or underneath your night time moisturizer. It can raise your skin's moisture levels while helping to plump up your skin and tone down expression lines. I like using this serum to soothe and hydrate my skin after using a facial mask. While I have not had a chance to try out this product yet (I am in the midst of other skincare testing), I do have some product information for you! As you can see, this cream just got a new name! It is now called "Collagen Regeneration Cream". This cream contains 'tissue growth factors" (and supporting elements) which help to reverse sun damage and promote "healthy" collagen growth. You can apply this cream morning and/or at night over serums, gels, or glycolics or under Alpha Lipoic or other creams (per Reviva Lab's instructions). Reviva suggests using this cream in 2-week cycles. Benefits: This cream can improve tissue structure, increase collagen synthesis (to diminish fine lines), and can improve texture and tone of skin. The Skinny: 2 oz jar retails for $35.00. The Prize: One randomly selected winner will receive Reviva Lab's Hyaluronic Acid Serum and TGF Beta-1 Cream (new name: Collagen Regeneration Cream). The winner has 48 hours to respond to winner announcement email or a new winner will be selected. Contest starts on Sept 13th, 2012 and ends on midnight Oct 5th, 2012 . 4. Answer question in comment form below:"What is your favorite skincare item in your current routine. Would you recommend it?" Thanks again for joining me for the past 6 months with my Spring/Summer Reviva Labs Giveaways! Most importantly, thank you *so much* for taking the time out of your day to read my blog! My fav is my peel pads for St Ives. They are a wonderfully gentle chemical exfoliant that I absolutely recommend. I love my Josie Maran moisturizer w/sunscreen. I two in one product. I would definitely recommend it tho perhaps not for people that may be extra sensitive to scents. There is a slight orange scent that fades but is a bit strong when first applied. I love my new Suti organic face oil! I use it on my face and I also rub it into my nails. I highly recommend this product!! I love reviva labs seaweed soap. Its the only soap I've ever used and feel totally clean after I use it. It gives my skin a lovely glow and my skin looks so healthy. I liked it so much I told my sister about it and even bought her a bar to try out and she loved it. Now she keeps her own stock of it. I would love to try more reviva labs products, Thanks, Keisha. My favorite is the Yves Rocher daily moisturizer. So creamy! I love my Avon hydroxy serum and my Avon Clearskin scrub. I really like MyBody Revitalizing Foaming Cleanser - it cleans without stripping the moisture out of my skin. Lately I have had to include Neutrogena Scrub to my face to battle acne. Yes, I would recommend the line of skincare. Thanks for the great giveaway! I really like my Exuviance T5 Filler because it makes my skin so soft and moisturized. "What is your favorite skincare item in your current routine? Would you recommend it?" MY FAVORITE 2 items would be the Pore Professional Pro Balm by Benefit. It INSTANTLY gives the appearance of non existent pores.I never leave home without it. Second would be my BB cream by L'oreal. I haven't been able to try Smashbox yet but I have heard it is great.